This bar has no snap. It has no crackle. And it has no pop. Cocoa Rice Krispies isn't a bad cereal. In the chocolate cereal genre, it runs 4th behind Count Chocula, Cocoa Pebbles and Cocoa Puffs. Unfortunately, when it comes in bar form, it tastes burnt. The "milk" portion of the bar, which is a b.s. description for frosting, is a substandard sugar cream topping with an unappealing aftertaste. These meal-on-the-go bars are dangerous animals. 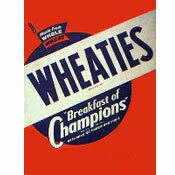 Breakfast cereals became popular because of their convenience - negating the need to cook in the morning. Now, we have these bars to save us the back-breaking effort of pouring milk in a bowl. Next, we'll be able to skip the strenuous act of chewing with Rice Krispies Pills. Where will it end? Skip this product. Wake up 5 minutes earlier and enjoy a bowl of Count Chocula instead. $2.99 reflects the price of 4.9 ounce box containing 6 bars. 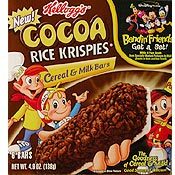 What do you think of Cocoa Rice Krispies Cereal & Milk Bars? The bar starts with sweetened condensed milk, then Cocoa Rice Krispies fused together with sugar. I'd recommend this bar to anybody.